CNN has doubled down on trying to divert the attention of its viewers to Russia after it was made public that CNN allegedly leaked question(s) for the Presidential Debate to the Democratic National Committee in advance. CNN, a large contributor to the Hillary campaign, denies the allegations. Instead, CNN believes that Roland Martin of TV One was responsible for the leak. The question(s) were leaked to Interim chair of the DNC, Donna Brazile. She in turn gave the question(s) to Hillary Clinton. WikiLeaks is responsible for making the e-mail public. U.S. intelligence officials publicly accused Russia of “feeding” information to WikiLeaks. The Obama administration even hinted at retaliating against Russia with its own cyber attack. Intelligence agencies have not offered up any solid proof to back up their accusations that Russia was responsible for the DNC hack. Russian President Vladimir Putin has heavily criticized the U.S for the allegations. [The U.S] keeps whispering into our left ear and then into our right ear: “Pay no attention to this, all of this will pass and we will be friends again. This is wrong, it is wrong to use Russia as a bargaining chip in internal political struggles and damage interstate relations. In a different interview, Putin said, “Everyone always asks; who did it?” He added, “Everyone is talking about who did it, but is it so important who did it? What is important is the content of this information that was given to the public. There should be a discussion about this and there is no need to distract the public from the essence of the problem. He said the Americans should be less worried about who did it, and more concerned about the information that has been released. He referred to the situation as a U.S problem and not a Russia problem. Putin said he heavily blames American media. Russians say that Hillary has shown great hypocrisy by accusing Russia of interfering with the U.S election. 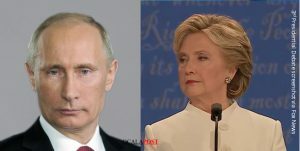 Russians accusations were reiterated when Hillary lied during the final Presidential Debate. During the debate, Hillary told the public that she had never seen anything like this, as far as Russia interfering with an election. However, she has seen something similar before. Putin was referring to the Russian election and allegations that the election was “rigged” to favor ruling the United Russia party. Following the vote, massive “protests” erupted. The international observers were there to monitor the election. “She set the tone for some of the activists inside our country, gave them a signal, they heard this signal and started active work with support from U.S. State Department,” Said Putin. 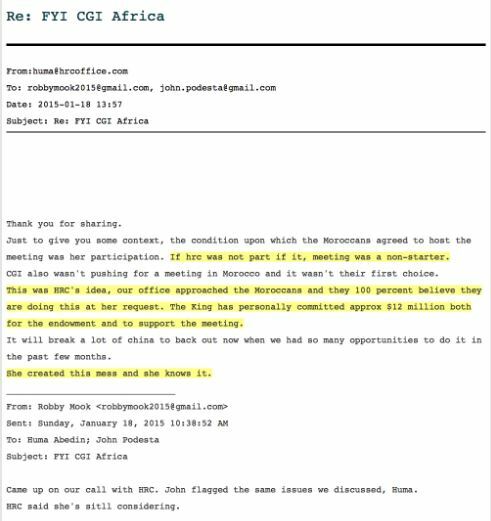 In one e-mail, it shows that Hillary solicited a $12 million donation from King Mohammed VI of Morocco. The money was to be funneled through the Clinton Foundation. Hillary’s own state department has long preached that the Moroccan government was corrupt. The e-mail was written by top Clinton aide Huma Abedin, and addressed to campaign managers Robby Mook and John Podesta. Wikileaks e-mail by top Clinton aide Huma Abedin, and addressed to campaign managers Robby Mook and John Podesta. It has come to the point where Americans realize that the mainstream media, specifically CNN, who has publicly announced they are giving Hillary a free ride for her campaign, is biased. CNN even went as far as to tell viewers that reading the Wikileaks e-mails would be illegal, which is a false statement. CNN is owned by Turner Broadcasting System, which is a division of Time Warner. Companies like this are publicly traded. And while they are supposed to remain impartial on any given subject, mainstream media seemingly avoids certain topics, especially involving Hillary, at the risk of offending their investors. The fact is, Americans are not the only people who are fed up, or that have turned to social media and demanded a boycott of CNN. The Germans, like Russia, also believe that the American mainstream media manipulates the point of view of their viewers. On October 20, the anti-immigrant party Alternative for Germany leader, Frauke Petry, told Reuters in an interview that she believes Trump offers change in the relationship between the U.S. and Russian relations, which would reduce conflict in the Ukraine, to Berlin’s advantage. Both Russian and German politicians have stated that Americans should not believe the lies and rhetoric coming from the media or Hillary when it comes to portraying Trump as a president who would start a war. He said he believes that if Hillary were to win the presidency, the interstate relationship between Russia and the U.S. would get worse. “If [Americans] vote for Hillary, it’s war,” Zhirinovsky said during an interview with Reuters. New e-mails leaked by WikiLeaks show that Hillary intentionally tried to publicly link Trump with Putin in order to discredit Trump’s character. Hillary’s staff also admitted that [she] has created the reasons she is not longer trusted by the public. The e-mail is very telling and has been included in its entirety. That’s good, sooner it’s clarified the better, and the stronger the better. Re the Trump ISIS video, if we don’t have the proof campaign should assign 100 people to look for it ASAP, there is probably something on tape somewhere. p.s. On the UN last week, support it yes, but be careful. I love Kerry like a bro’ and support him always as HRC should and does. But be careful about the U.N., support but don’t go too far. Putin did not agree to anything about removing Assad and continues to bomb the people we support. We pushed the same position in 2012 (Geneva 1, which HRC knows all about) and Geneva 2 in 2014. Odds that Putin agrees to remove Assad are only slightly better than the odds the College of Cardinals chooses me to someday succeed Pope Francis. Best approach is to slaughter Donald for his bromance with Putin, but not go too far betting on Putin re Syria. Her reference was not to ISIS but to going after Assad diplomatically because of UNSC resolution passed Friday. We will make that clear. She has given two major speeches about how we are NOT where we need to be on ISIS.